This juvenile Mantis has just shed her non-flying shell, and will soon be ready to fly off to lurv and adventure...who would not be interested in a comely-featured gal like this! Amazing creature , Ray. Good close ups. Ray: I am very attracted to these critters, Frank. Ray: Imagine if these were as big as Humans, Larry. Beautiful photos of her! I wonder what the missing unicorn horn is for? Ray: She does seem to be growing a horn, Elizabeth. Man alive these are some cracking shots. I assume you also can now carry the title of 'Mantis Whisperer'....?? Ray: A gorgeous critter, Astrid, and I enjoy the challenge of getting close enough for shots like this. I think she likes the look of you, too, Ray! HA! A face only Mama would love, right?! I think she is gorgeous, Ginnie! On dirait qu'elle prend la pose pour toi. Ray: e crois que tu as raison, Martine ... Je l'ai caressée légèrement pour l'encourager à me regarder. Ray: It was the gentle stroking of her back wot dun it, Squire...all gals seem to like this! I think she has intentions in your direction. Not being an expert on the mantis and the two large things that would be ears on say a dogs head are they eyes or ears? Ray: It is a look of lurv, Alan! Those "ears" are actually eyes...insects don't have ears. What a weird looking thing Ray. Ray: Ain't She a purdy gal, Chad! Great shots of this here mantis. Reminds me of someone, but it i not my mother in law. Ray: Reminds me a little of Dame Edna Everage, Louis. They are the strangest looking of characters. I think stroking a gentle mantis and disturbing a fire ant nest is quite different. She is a beaut. 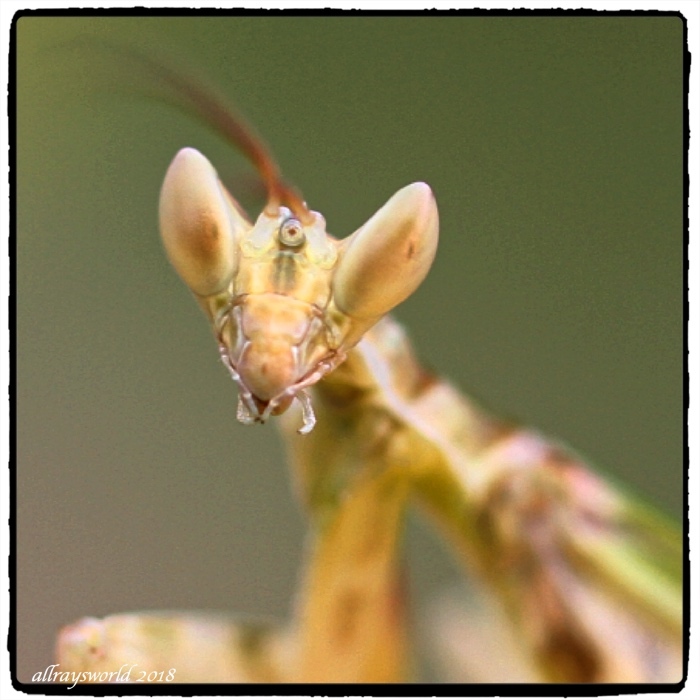 If you gently stroke a Mantis it may cooperate with you, and will not bite. If you disturb a Red Ant nest, you will be bitten! Ray: I have visited her every day for about 3 weeks, Bill...I am confident she remembers me, and knows I am not a threat to her.